Like Alexander's Feast, the composer's more famous work in honor of the patron saint of music, George Frideric Handel's Ode for St. Cecilia's Day, HWV 76, is a setting of texts written in honor of Saint Cecilia by John Dryden in 1697. Perhaps inspired by the sweeping success of Alexander's Feast (composed and first performed in 1736), Handel revisited Dryden's ode three years later to create a new, shorter work. The circumstances of the November 22, 1739, Lincoln's Inn Fields premiere of HWV 76 were something of an omen of things to come: the Ode for St. Cecilia's Day was presented as little more than a prelude to Alexander's Feast, and indeed the work has remained in the shadow of its sister piece ever since. The Ode is of very considerable merit, however; the three choruses contained within it are among the finest ever crafted by the composer, and the six arias are of equally high quality. HWV 76 is properly an ode and not an oratorio; there is no plot, but rather a series of recitatives, arias, choruses, and instrumental pieces that extol the praises of the St. Cecilia (a third century martyr). Handel's score is for soprano and tenor soloists, the usual SATB chorus, and a colorful orchestra made up of strings, continuo, flute, double reeds, trumpets and timpani. 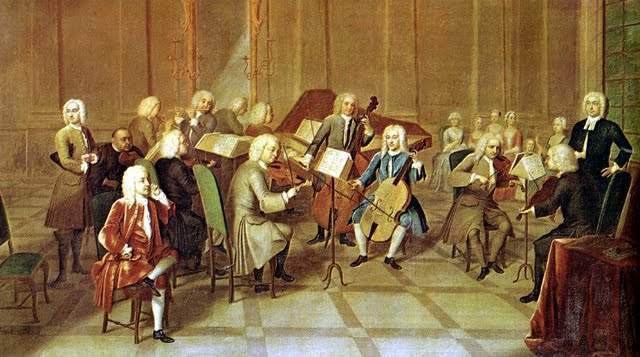 Handel's tendency to borrow music from himself and other composers is famous, and indeed, essentially all of the melodies contained in the Ode for St. Cecilia's Day were lifted straight from the keyboard pieces of Gottlieb Muffat's Componimenti musicali (published ca. 1739). However, the working-out of this pre-fab material over the course of the Ode is entirely Handel's own. The musical subject of Dryden's ode provides a sure footing for all sorts of musical text-painting and allusion. The Ode falls loosely into two halves, each of which ends with a chorus, and which are separated by an orchestral March. The work's two-part overture was taken from, or perhaps used as the model for, the composer's own Concerto grosso, Op. 6, No. 5, composed around the same time. The singing begins with a recitative for tenor solo, "From harmony, from heav'nly harmony," the text of which is immediately echoed in the first of the three choruses. 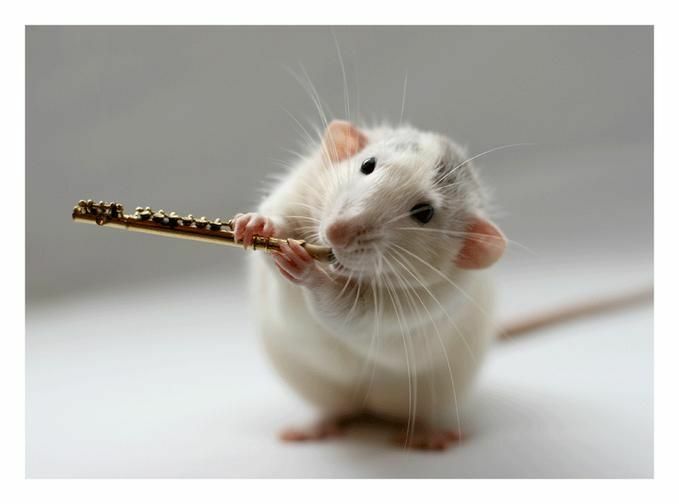 The soprano follows with the stunning but graceful aria "What passion cannot Music raise and quell," and the boisterous tenor counters with "The Trumpet's loud clangor," immediately taken up by the chorus. A succession of four arias--three for soprano, one for tenor (but that one the delightful "Violins proclaim")--begins the second half of the Ode for St. Cecilia's Day. A soprano recitative ("But bright Cecilia rais'd the wonder high'r") prefaces the final chorus ("As from the pow'r of sacred lays" / "The dead shall live"), itself a spectacular example of Handel's choral writing. It moves seamlessly from the opening soprano solo to a purely choral climax and finale in which the composer displays his contrapuntal wizardry in a stunning double fugue. Source: Allmusic (https://www.allmusic.com/composition/ode-for-st-cecili as-day-song-for-st-cecilias-day-for-soloists-chorus-orc hestra-hwv-76-mc0002406927). 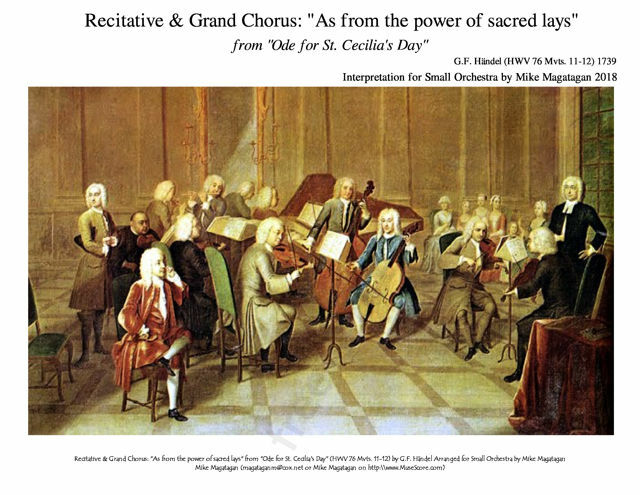 Although originally written for Mixed Chorus & Baroque Orchestra, I created this Interpretation of the Aria: "Recitative & Grand Chorus: "As from the power of sacred lays" from "Ode for St. Cecilia's Day" (HWV 76 Mvts. 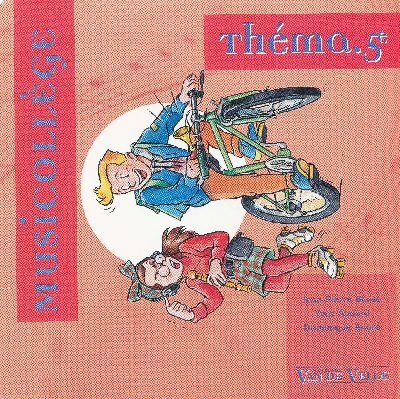 11-12) for Small Orchestra (Piccolo Trumpet, Bb Trumpet, Flute, Oboe, Bb Clarinet, English Horn, French Horn, Bassoon, Timpani, Violins, Viola & Cello).